Here's a simple fruit leather recipe to get you started! Fruit leathers are easy to make and make good presents. I only came across the a few months ago when I was round at a friend's house. She was kneading something grainy-looking in a bowl. It turned out to be hawthorn pulp! I have since discovered that fruit leathers are a great way to store excess fruit - particularly apples. Making fruit leathers is not expensive, especially if you can use residual heat from your cooker to do most of the work. Fruit leather makes a great fruit snack for energy on the go. Or pop them into school lunch boxes for healthy, tooth-friendly children's snacks. So what are fruit leathers? Fruit leathers are simply condensed fruit. Fruit pulp is dried until it becomes leather-like. It can then be stored in jars and used for a variety of purposes. Those semi-transparent chewy fruit bars that you can buy in health fruit shops are essentially fruit leathers. The nutritional value of fruit leathers is high. Most will contain all the same vitamins as fresh fruit - except that the quantity of vitamin C will be reduced. Many of our common fruits have outstanding nutritional properties. Organic fruits can be especially good. Really, you can experiment with different mixtures. I'm only just getting going on fruit leathers so I have limited experience on which to draw. But I can say that apple makes a fine fruit leather - just by itself. If you add a few sloes the colour goes from a light brown to a dark red colour - and the taste is slightly more plummy. I shall add fruit leather recipes as I find good combinations. As I write this, the main fruit season is at an end. I'm still drying apple rings and making apple leathers. I can't decide which is best - they are both so yummy! Here's a fruit leather recipe for apples - which will give you the general idea. Wash the apples and remove any bad bits. Roughly chop them and place them in a good pan. Add enough water to just stop them burning on the bottom of the pan - as little as you can, really. Slowly heat them until they are cooked and mushy. Take them off the heat and sieve the purée to remove all the skin and tough bits. Return the apples to the pan and reduce down further. Be careful to avoid burning them. When the mixture is reasonably stodgy take it off the heat. Grease a metal tray with a little vegetable oil - just a smear. Spoon the mixture onto the tray and spread it fairly thinly - less than a centimetre's depth. Use a palette knife or similar to get an even surface. Set the tray in the bottom of a very cool oven to dry out. This can take some time. If you are cooking other items and you need a higher temperature you can put the tray on the floor of the oven - but do check often as it is quite easy to burn the mix. When the leather starts to take on a glassy, semi-transparent look, you can try to lift it from the tray with the aid of a spatula or palette knife. If it starts to tear you need to give it more time. Lift the leather off the tray and put it somewhere it can carry on drying more slowly. The surface may remain a little tacky to the touch. When the leather is firm and has lost most of its stickiness you can dust it with a very little cornflower or icing sugar to help stop it sticking together in the jar. I've not done this so far as most of it just gets eaten! Cut it into strips and store it in a large jar with space for some air circulation. It's best to sterilise the jars before use, of course. Check the condition of your leathers from time to time. They should store for a year or two if need be. 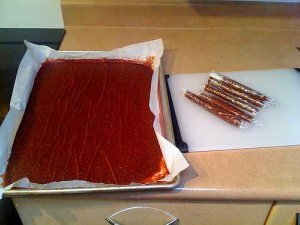 Here's a fruit leather recipe which some people may find easier. Essentially, the method is exactly the same as above but at the start you peel and core thoroughly so that you can avoid all that sieving. Put the prepared apples into a pan and proceed as above. If you add other fruits, they too should be thoroughly washed, skinned and cored, or the pips removed so that the resulting purée contains no bits. Anyone who has prepared baby food for the youngest members of the household will know what to do!
. I have one of these and it's great, especially if you want to dry apples, too. See my page Drying apples for winter sweetness for more on this. You can make a decent fruit leather recipe to suit the fruits you have available throughout the summer. I've only just discovered the wonders of fruit leathers, so I hope to find a new fruit leather recipe for each of the fruits I grow. I'll add them here when I find mixtures that work. Fruit leathers can make appetising Christmas presents for friends and relations. They can certainly provide a bit of novelty and a talking point!